Recognizes all FLIP splice variants including FLIP alpha, beta, gamma, and delta. Synthetic peptide corresponding to Human FLIP aa 2-19. 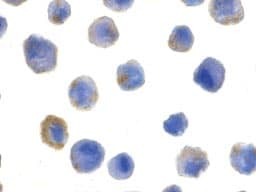 FLIP Antibody is affinity chromatography purified via peptide column. Our Abpromise guarantee covers the use of ab8421 in the following tested applications. WB 1/500 - 1/1000. 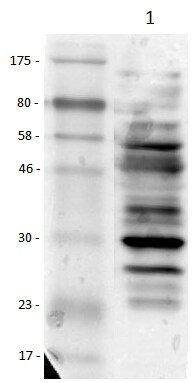 Predicted molecular weight: 55 kDa.Can be blocked with Human FLIP peptide (ab8457). The caspase domain lacks the active sites residues involved in catalysis. 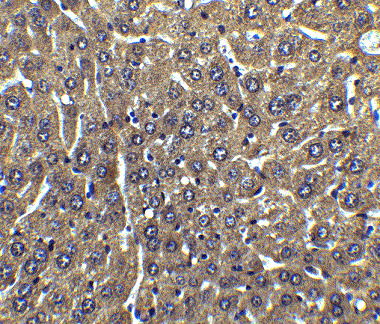 Immunohistochemistry of FLIP in mouse liver tissue with FLIP antibody at 5 µg/ml. delivery time? Delivery would be through Tecnolab? The peptide would be free, and it would be sent through Tecnolab. As it will be delivered by them I am unsure of how long it will take. The peptide is in stock and would be sent out as soon as possible. I will contact Tecnolab to enquire how long this will take to get to you.